Electrosonic was also responsible for the integration and installation of the complex digital playback system that supports the multi-channel synchronization necessary for display on the media features. Electrosonic was involved with the mammoth project for close to two years, providing the client with specialized management expertise throughout. The IEMS media features are located in the 150,000-square-foot Antonio Villaraigosa Pavilion (Great Hall) beyond TSA screening and consist of the Welcome Wall, the Bon Voyage Wall, the four-sided Time Tower, the Destination Board and Story Board and two portals that usher travelers to their departure gates. Integrated into the terminal’s architecture, they are more than digital signage or multimedia eye candy. Each media feature serves a specific purpose for the passengers, offers sponsorship opportunities for marketers, and dazzles with its ability to merge the latest technology with soaring architectural elements. The Welcome Wall, which displays joyful scenes of greeting for arriving international passengers, is a high-resolution 6mm LED Daktronics wall measuring approximately 26 by 84 feet, divided into two screens and surrounded by a decorative glass frame. The adjacent Bon Voyage Wall, with content inspired by photographer Philippe Halsman’s Jumpology photographs, is a similar configuration with dimensions of 13 by 23 feet. The Destination Board is a different take on flight departure information. The 80-foot wide screen displays flight details from LAX’s Flight Information Display System database. The high-resolution 6mm LED screen is partitioned into a central flight info display flanked by informational side panels and framed by a low-resolution crown of LEDs. Content on the side panels is linked in real time to destination flights displayed on the board to provide travelers with fun facts, weather briefs and images of destination cities, while a graceful arched crest features international flag graphics or subtle arrays of colors. The four-sided Time Tower is built around the Villaraigosa Pavilion's elevator tower and is designed to not only tell time, but also explore time as part of the travel experience. It is 72 feet high with a base of diffused glass panels and an interior layer of 10mm LEDs. Sensors sensitive to passenger gestures create constantly changing patterns in the content generated through customized programming and the capabilities of the system. The upper surface features high-resolution 6mm LEDs and integrates a functional clock face with entertaining content incorporating a time theme. Along the west side of the Villaraigosa Pavilion, poised above retail shops, is the 120-foot-long Story Board feature. Its high-resolution 6mm LED tiles form five display walls of varying size and shape across a structural frame. Once again, Electrosonic worked closely with all the vendors to achieve pixel-for-pixel consistency in a huge palette of pixels comprising custom content that tells ambient narratives about travel. “It was an integration challenge to make sure the sensor and playback gear could co-exist in the limited space within the portals,” Hinckley points out. Electrosonic also designed the layout and installed the Main Equipment Room (MER), which is comprised of a control and rack room. Miles of optical fiber from all over the terminal feed into the MER, where over a 1,000 individual connections provide the capability to display and control the content displayed on each feature. Cameras in the terminal that show the content-display status of each feature allows a single operator to monitor all features simultaneously. 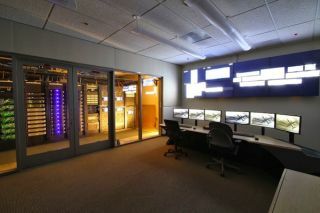 Additionally, a 65-inch display was installed in the control room where new media content from prospective partners can be reviewed prior to public display. Janne Hammel believes that once travelers experience the new terminal and its standout media features, they’ll have a greater appreciation for the work of all the vendors involved. “You can talk about physical dimensions and number of pixels, but until you’re standing in that space experiencing the media and how it integrates with the terminal's passenger activity and flow, you don’t realize how it exceeds your expectations. “L.A. is a world destination and that’s reflected in the content of the media features and their integration into the physical structure of the new international terminal,” she said. Electrosonic is proud to be a part of the LAX Integrated Environmental Media Systems (IEMS) Team, which includes: MRA International, IEMS Project Director; Marcela Sardi of Sardi Design, designer of the media features and Creative Director; Smart Monkeys Inc., Technical Consultant and system programmer for the content delivery system; Daktronics, display supplier; Moment Factory, Executive Content Producer; and Digital Kitchen, Supportive Content Producer.